Note: This is a grant forecast; the application is expected to open on or about March 17. Description: Projects that align with Promise Zones are encouraged. 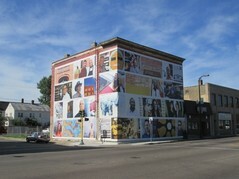 The US Department of Health and Human Services (HHS) Administration for Children and Families (ACF), Office of Community Services (OCS) will award approximately $27.2 million in Community Economic Development (CED) discretionary grant funds for well-planned, financially viable, and innovative projects to enhance job creation and business development for individuals with low-income. 3. The Board of Directors must have representation from each of the following: community residents, business leaders, and civic leaders. Faith-based and community organizations that meet the eligibility requirements are eligible to receive awards under this funding opportunity announcement. Faith-based organizations are encouraged to review the ACF Policy on Grants to Faith-Based Organizations at: www.acf.hhs.gov/acf-policy-on-grants-to-faith-based-organizations. In January 2016, developer Building Blocks held the grand opening for the Commons at Penn Avenue, a mixed-use development served by several current and planned public transportation lines in the Willard-Hay neighborhood of north Minneapolis. All 47 units at Commons at Penn are affordable to households earning up to 50 percent of the area median income, and the development offers after-school and summer programs for resident youth. The development is also bringing fresh food to an under-served neighborhood with a grocery store, Wirth Co-op, in the building's first floor. 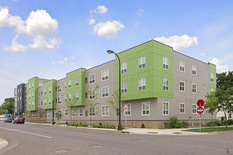 Commons at Penn fulfills the affordable housing and community development vision of Devean George, founder and executive director of Building Blocks and a former basketball player with the Los Angeles Lakers who grew up in North Minneapolis. In 2014, George purchased two city-owned parcels at the southwestern corner of the intersection of Penn and Golden Valley Road. The developer combined those with three adjacent parcels already owned by Building Blocks to create a site large enough to accommodate its first development, a 34,000-square-foot, 4-story, mixed-use building. According to Scott Anderson, principal at Green Tree Consulting and a consultant for Commons at Penn, Building Blocks conducted door-to-door neighborhood outreach and coordinated with the Northside Residents Redevelopment Council, a nonprofit neighborhood organization, to ensure that the development met community needs. The link above leads to the Minneapolis Promise Zone(MPZ) data set from MN Compass. MN Compass partnered with our Data Collection and Evaluation VISTA, Sharin Tellez, to draw MPZ specific data. The MPZ specific boundary allows us to have accurate and uniform data for the longevity of the initiative, which did not previously exist. Analyzing this data, it is easy to see the disparities that exist on the Northside, specifically within the MPZ boundary. This tool is essential to compare the MPZ data to other areas of Minneapolis as well as the city as a whole that existed previously on MN Compass. Three Minneapolis City Council members are moving ahead with an ordinance to protect people who use housing vouchers from discrimination by landlords. Wednesday, Council Member Elizabeth Glidden and other City officials brief the Minneapolis Public Housing Authority about the proposed ordinance. Since September, a group of five young men from Bethune Elementary School in North Minneapolis has been programming and building robots. It's par of the First Lego League Tournament. The program, estimated to cost $1.2 million, aims to give small businesses the rare chance to work with the state's largest county, gain experience on larger projects and put women- and minority-owned companies to work. After serving a term for murder, Kagalee Babu Brown left prison in 2011 and worked to turn his life around. Brown opened a printing show with his fiancee, Katie Dupay, and had become recognized as a leader in the north Minneapolis business community. The Northern Metals Recycling facility in north Minneapolis, long a source of residents' air quality concerns, will relocate to Beck, Minn., by August 2019. Under an agreement reached with the Minnesota Pollution Control Agency (MPCA), North Metals will also pay $2.5 million in costs and penalties.